In 2015, I had the honor to become a king cobra tracker for the Sakaerat Conservation and Snake Education Team in Northeast Thailand. 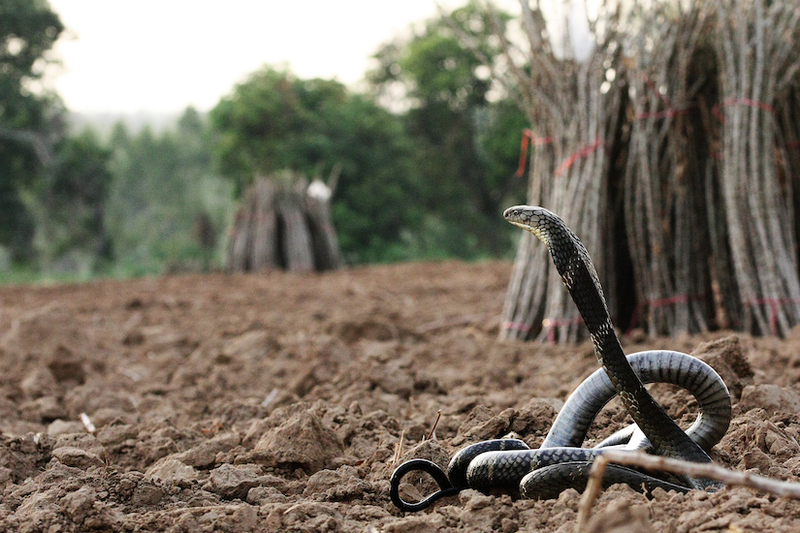 The life of a king cobra tracker can be pretty intense, especially during their breeding season! King cobra trackers must be prepared to work long days in the field during very hot and humid conditions. Four times a day you have to check where your king cobra is hanging out. The king cobra really rules your work schedule! If the snake decides to keep moving till midnight, you have to follow it the whole time. The big nightmare of a king cobra tracker is to lose the signal of the snake which basically means you have to look everywhere to find the signal again. Deep into the forests, in the villages, around the agricultural fields, everywhere. King cobras are capable of making big movements! A movement of a few kilometers is quite normal, which compared to other snake species, is a really long distance! The fastest Thai king cobra movement ever observed was 1.5 kilometers in just 10 minutes! After pin-pointing the snake’s location it’s time to gather some data! You want to make sure to record as many data as possible about your snake and its location. Especially tracking in and around human dominated area’s locals often come to check out what we are doing. We always try to explain in our best Thai language, together with our hands and feet, what we are doing and why. It’s important to have the local community involved in your conservation projects. Tracking king cobras can be intense but every single day was so totally worth it. Jory van Thiel is a young, passionate and futurist scientist born in the Netherlands in 1995. Jory is a bachelor’s student in Life Sciences with a specialisation in biomolecular research. Before he stared his bachelor degree in Life Sciences, he studied ecology for four years. After conducting research on the Common European Viper Jory became the youngest experienced King Cobra tracker at the age of 19 years old. Jory is incredibly passionate about nature with his main interest in venomous and poisonous animals. Pictured above are moments captured by Jory while tracking king cobras in Thailand, which were mostly near areas disturbed by humans. This long-term research project does not only further uncover the mystery of king cobra ecology, but it actively discovers solutions for how humans and king cobras can live together in harmony. We greatly appreciate Jory for sharing his king cobra tracking experience in Thailand with our supporters, but for also graciously allowing Save The Snakes to use his photos of king cobras for our snake conservation efforts.